For this edition of Writers' Challenge, we tried something a bit different by unlocking the wonder of another medium for inspiration. If a picture is worth a thousand words, then the challenge was to provide those words and tell us what circumstances created this image. Entrants were allowed to choose to respond to the image via fiction, poetry or non-fiction. With a number of great entries, judging was a challenge. Though we originally set out to seek one winner, we chose two. April Salzano (poetry) and JaeLynn Topper (fiction) share first place and each will receive a $25 giftcard to Barnes & Noble bookstore. We must also give honorable mention to A.J. Huffman, Patrick Byrne and Deborah Davis. The list could go on. Entrants took up this challenge with creative gusto. Read the winning entries below and join us in congratulating everyone on a wonderful job! under northern sun, late July. after loss rocks it to sleep. Dust floated through the air and clung to every surface of my Jeep as I drove along the gravel road. I swore and grabbed my cell phone to call my Realtor who arranged a showing of a house he claimed was perfect for me. Before I could pull to the side of the narrow road, I spotted a for sale sign a few hundred yards ahead. Pulling up in front of a two-story Victorian, I twisted the ignition key, silencing the engine. Jack waved and strolled my way as I closed the door. “And in town,” I said, nodding at the empty fields surrounding the property. I shrugged, but followed him inside, thinking about the contemporary style I preferred. Yet the ornate trim and crystal chandelier captured my attention as soon as I stepped into the foyer. Hardwood floors gleamed under period furniture that accentuated the rooms without disrupting the flow of daily traffic. Impressive details adorned each room. Built-in cabinets covered an entire wall of the over-sized kitchen. Jack opened the patio door and waited as I walked outside. Expecting to see a well-manicured lawn, I stood speechless. Weeds close to two feet high covered the entire back yard. Sitting toward the back of the property, in an area far from the road, was an old blue swing set. The contrast between the inside and the outside of the house was a shock. Where the rooms appeared pristine and well cared for, the homeowner obviously neglected the yard. Jack stared into the distance before replying. I shook my head, trying to recall anything about such an accident. Craysburg was a small town. The majority of the population knew what was happening long before they read it in the local paper. Yet the accident didn’t ring a bell. “How can I not remember hearing about such a devastating crash?” I asked. Kim was Jack’s sister. She had also been my wife. 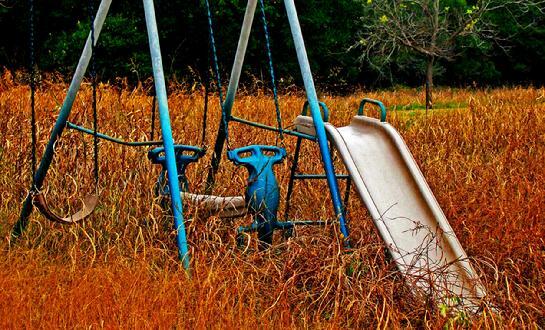 I picked my way through the dead grass and weeds until I stood next to the slide attached to the swing set. Images of a young girl laughing and playing ran through my head. My fingers curled as if holding the chains hooked to the rubber seat. Rationally, I knew he was right. Kim’s death two years after our marriage left a hole in my life I hadn’t been able to fill. A routine exam revealed a fast-growing cancerous tumor that didn’t respond to treatments. Buying a house was a first step toward moving on. I walked around the little slide, imagining my late wife helping the children we would never have climb the steps. Others looking at the house might not see any value in the deserted playground equipment. I pictured it with fresh paint and a shiny slide. The desolation of the yard begged for the happiness it once had. I walked back inside, my heart heavy. No one could fault the beauty of the interior. The restoration should have been enough to sell the property. I could only guess that maybe the homeowner’s personal losses had potential buyers thinking the land had bad karma. Jack locked the back door and waited for my reply. I turned my head to think, catching a glimpse of the abandoned blue swing set. Jack stared at me but didn’t say anything more before leaving the room. When he returned, I was reading the article about the accident on my phone. I clicked off the page and took a deep breath. I moved in two months later. Landscapers replaced the weeds with sod and planted new flowers. My personal project was restoring the swing set. I stripped the frame, painted it the original blue and white, added new chains and seats, and attached a shiny slide. The only change was the new fence that surrounded the back yard—and a small plaque in memory of the innocent child whose tragic death gave me the incentive to live again. Bio- JaeLynn Topper has led a varied and interesting life, beginning as a blueberry picker (she might have been a child when she did this—she's not saying). Stints as a babysitter, a certified nursing assistant for senior citizens, and an office manager followed. During her years as a co-owner of a body shop, she helped overhaul classic cars. She was part of a small group who traveled to New York City after the 9/11 attacks to prepare and serve Thanksgiving dinner to firefighters. This Midwestern cat lover has a soft spot for fast cars (especially Corvettes), likes word games, tattoos with meaning, and loves nothing more than walking on the beach or baking cookies and bread to share with friends. She has two grown children who occasionally honor her with temporary custody of their antique furniture and beloved cats. JaeLynn uses her own experiences and challenges in her writing, infusing her stories with genuine emotions and life-lessons. This on-line magazine and all the content contained therein is copyrighted.